When it comes to the Injury Fund Cross-Country Carnival, the idea for most coaches is to have their athletes hold back a little bit and use the season-opening meet as a way to get the cobwebs out and start getting into racing mode for the fall season. The general consensus is there is no need to set PRs in September. Most of the elite athletes that gathered at Burrillville Middle School on Saturday listened to their coaches’ advice. But further proving just how special this season can be, it still didn’t stop anyone from registering fast times on the challenging five-kilometer course. Sixteen athletes made National Elite status on the MileSplit rankings and plenty more blazed to personal bests at the invite, which attracted schools from across the state and nearly 1,200 runners. 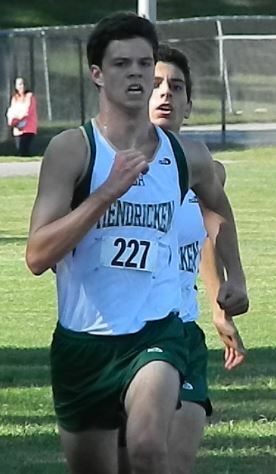 Bishop Hendricken teammates Colin Tierney and Mike Potter posted the fastest times of the day, placing 1-2 in the Gray Division with identical clockings of 15 minutes, 35 seconds. As a team, the Hawks averaged an impressive 16:14 for their varsity runners to easily take the team title, 17-62, over Coventry. The pair didn’t take long to distance themselves from the rest of the field. By the time they exited the woods just past two miles, the chase pack that consisted of most of their Hawks teammates was a good 300-meters behind. Potter did most of the pace-setting and held the lead until Tierney passed him during the final stretch with a blistering kick. Two runners who are no strangers to running fast times on the track surface make their debut to the cross- country trails a successful one. In the Sullivan Division, La Salle sophomore Eliza Rego took the pace out hard and never let up, cruising to a quick first-place time of 18:27. She was nearly a minute ahead of East Greenwich sophomore Margaret McCaffrey (19:25). Classical senior Maddy Berkson had an even bigger margin of victory in the Roy Division, crossing the line with a time of 18:33. Narragansett sophomore Marissa McPhillips was the runner-up at 19:48. Rego, who was one of the state’s best distance runners as a freshman last year, enjoyed the rolling terrain at Burrillville. Last year during the fall she competed on the school’s soccer team. La Salle, which was competing without some of its top runners, including last year’s state runner-up Sheridan Wilbur, edged Smithfield for the team crown, 36-38. Berkson, another soccer player turned cross-country runner, established her position early and looked smooth and relaxed as she briskly moved away from the pack. She hit her opening mile at 5:55 and was around 5:47 for her final mile. North Kingstown, which had its top seven runners among the first nine finishers, claimed the team crown with a 21-76 triumph over second-place Toll Gate. Skipper sophomore Bethany Nunnery was third at 20:03. 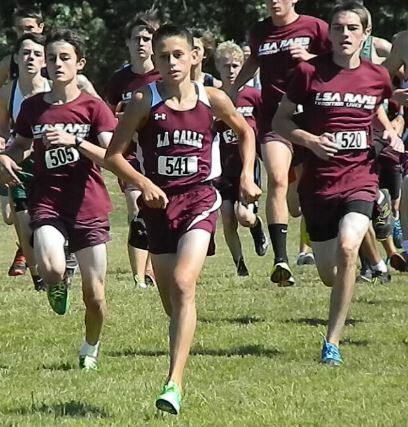 In the closest race of the afternoon, La Salle junior Jake Grundy took individual honors in the Boemker Division with a time 16:14. 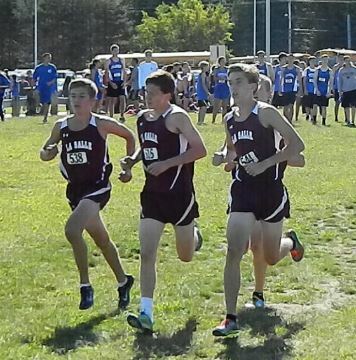 The top four finishers in the race also ran 16:14 with three wearing the maroon and white of the Rams. LSA junior Dan Paiva was second, North Kingstown senior Dallin Smith placed third and Ram sophomore Jack Salisbury was fourth. La Salle won the team prize, 26-45, over North Kingstown. East Greenwich showed its strength in the Brown Division, taking the first four slots. Junior Garrett Scanlon beat fellow classmate Graham Chapski by 31 seconds with his time of 16-minutes flat. The Avengers were easy winners as a team, defeating second-place Barrington, 17-47. Junior teammates Jessica and Allison Bellows, twin sisters from Coventry, went 1-2 in the Caswell Division race. 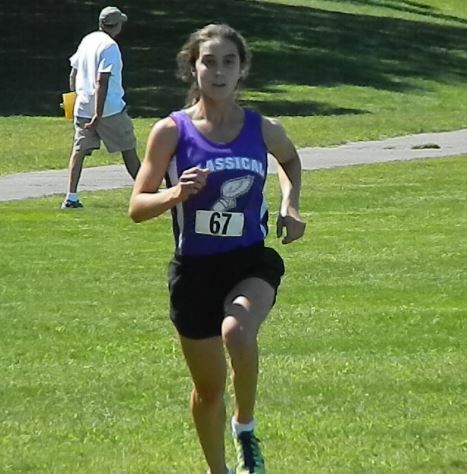 Jessica was one of three runners to dip under the 19-minute mark for the day, winning the race at 18:59. Her sister was timed in 19:22 for second. “We are very happy,” said Coventry coach Michaela Driscoll, who co-coaches with Carlton Bradshaw. “They have had a fantastic summer of training. Their base is really good. I think we still have a lot to accomplish, but they have done everything we can ask from them. I think they are going to have a great season. They are very intelligent runners. They have learned a lot about the sport last year and now we are kind of applying it. In the 2012 state meet, Jessica Bellows was tenth overall and Allison placed 13th overall. The Knotty Oakers beat South Kingstown, 25-56, for the team crown. 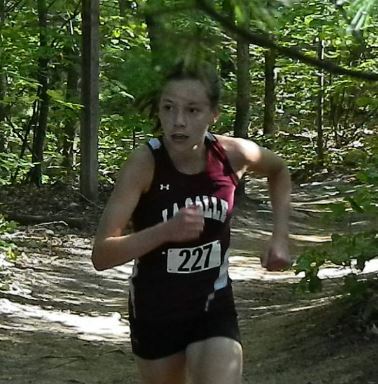 Burrillville junior Betsy Dumais was third in the race at 19:42 and Prout senior Jess Elliot took fourth in 19:52. Westerly senior Jackie Burr was the first to cross the line in the Hindley Division, posting a winning time of 19:05. Last year’s state champion Emma McMillian, a sophomore from Barrington, ran a relaxed 19:29 for second overall. The Eagles, who did not run at full strength in the meet, still claimed the team title with a 24-62 decision over Cumberland. In the Elliot Division, the Cumberland boys earned team honors, 24-48, over Chariho Regional. Exeter/West Greenwich senior Michael Dampier won the race at 16:35. Clipper senior Kevin Seaver was second in 16:43. The freshmen races were contested over a 2.5-mile distance. 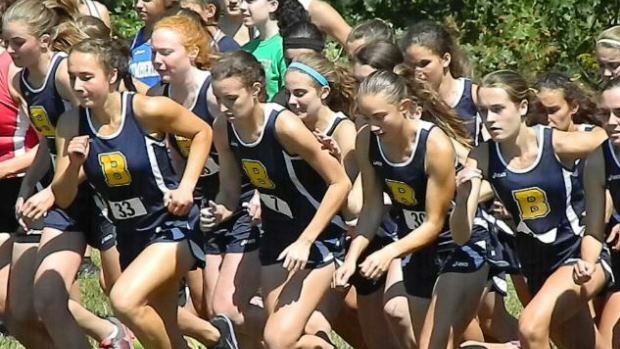 The girls’ title was captured by Smithfield’s Sydney Bagus at 16:44 and the boys’ crown belonged to La Salle’s David “D.J.” Principe, who uncorked a sizzling 12:50 clocking. Principe, who has potential to crack the top seven at the state meet in November, hit 5:05 at the mile checkpoint.